Looking for something to serve the family on those busy mornings? 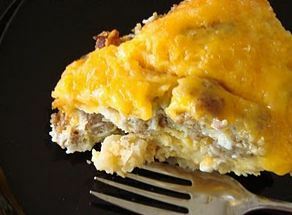 This Crockpot Breakfast Casserole is always a winner! Simple and gluten free! Looking for something to serve the family on those busy mornings? This Crockpot Breakfast Casserole is always a winner! This simple recipe is full of breakfast staples including eggs, hash browns, and sausage! The entire family will gobble this up! We have even made it for holiday breakfasts when the entire family is up early and hungry! Crockpot Breakfast Casserole is also very forgiving. You can change it up to suit your families needs and tastes. Use turkey sausage, change up the cheeses, add some additional spices or veggies; play with this recipe and make it your own! Thanks to Stockpiling Moms for the recipe. Layer potatoes, bacon, onions, green pepper and cheese in the crockpot in two or three layers. Beat the eggs, milk and mustard, salt & pepper together. Pour over the whole mixture. Cook with slow cooker on low for ten to twelve hours or until eggs are set and thoroughly cooked. Where do you put the sausage? I assume in the layers but it isn’t mentioned in the directions.